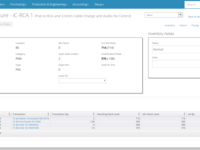 Manufacturing companies in the Unites States who require strong Work Order management, Inventory Control, and Costing. MRP designed specifically for discrete manufacturers seeking end-to-end control. 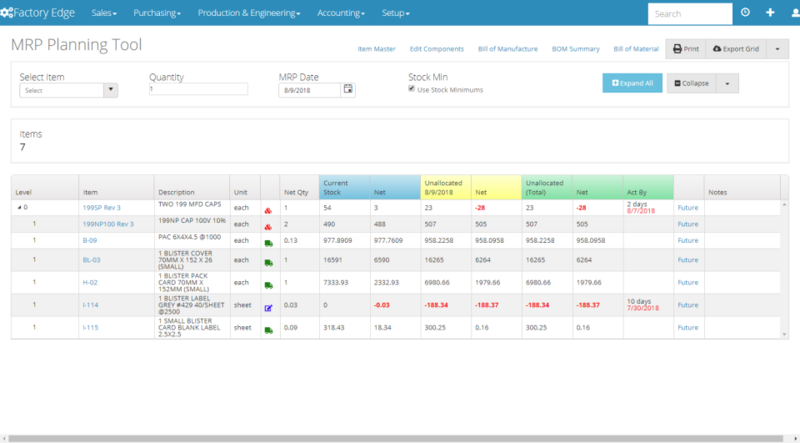 Fully featured system with MRP, Inventory Control, Shop Floor Scheduling, Multi-level Bill of Material, Full Accounting Features. For over 25 years FactoryEdge has been helping manufacturing companies. With clients like Northrop Grumman, Brodie Meter, and Gauthier Biomedical weve paved the way for easy-to-use MRP systems. FactoryEdge helped us grow and has grown with us. Pros: Handles all the functions of an ERP system and has some capabilities that some of the large systems don't have yet. FE is easy to use for all levels of personnel. New employees with experience in other systems and even those with minimal experience have become productive quickly. I believe this is because the software is solid and doesn't try to meet every customer demand which makes some systems excessively complex for small businesses. FactoryEdge strikes a nice balance for smaller manufacturers. Cons: Documentation was not as complete as I would like but it didn't seem to matter as we figured it out easily during implementation and new users had no problems. Integration with some other programs has been difficult, but not impossible. There are a few reports where the formatting could use improvement, but they are very serviceable. Overall: This has been our workhorse for a number of years. We were able to accomplish all that we needed to and we did not exhaust FE's capabilities. We discovered new features along the way which allowed us to use FE to grow. We have also been happy with FE's support and willingness to entertain our ideas for improvement. Great Software for Medical Manufacturer. Pros: The software is user friendly and gives the full process of manufacturing medical devices. The software is used from start to finish of each product and gives the user all information needed from Customer Service, Production, Inventory and Accounting. We have used this software for years and it has been audited by several Regulatory bodies with no non conformances ever noted. All request and questions are answered immediately and Employee training is available if needed. Cons: No Cons have been found. Any suggestions or questions were always answered and customized for our use. Overall: Our Company has used Factory Edge for years in our Medical Manufacturing. Factory Edge has exceptional Customer Service and has passed all extensive software Audits by our Regulatory Agencies. Any issues (which have been very few) that arise are immediately addressed and corrected. We use Factory Edge for our complete manufacturing process from beginning to end. 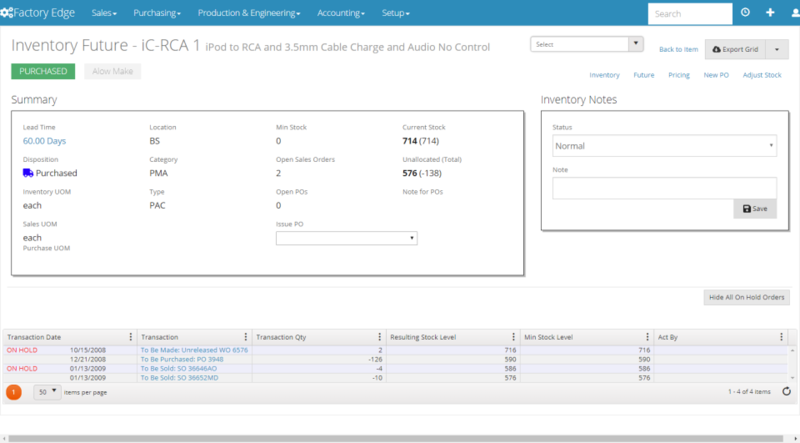 Pros: This program has many different options for inventory and lot control that are uncomplicated for users to understand. Someone with minimal computer skills are able to learn and utilize all of the many different features offered and making this a very good program for new hires and trainers alike. Cons: There are certain fields that cannot be revised once the information has been entered. While not all users should be able to change information, it would be beneficial if these could be changed by users with unlimited access. Overall: Since all, or most, capabilities are now being used, the process flow from order completion to inventory stock is more streamlined and better managed. Pros: I have been using Factory Edge for over ten years and I have to say that it has and continues to add value to my day. 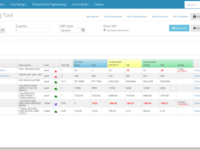 As a Manufacturing Manger who oversees 35+ employees, Factory Edge is easy to train my employees on. One of my favorite features is the main screen which provides you with valuable information at a glance. Also, reports are just a few clicks away! Overall: Overall Factory Edge has made it easy to communicate the needs of our customers, from order entry to shipping the order to our customer. Factory Edge has served us well and met our needs. Pros: It has excellent MRP logic / tools. We manufacture / produce a wide range of customized parts and Factory Edge is able to keep our material coming in on time and provide us lead times and costs every minute of the day. Cons: Really have no CONS, no software is perfect! If I had to note a CON, I would say its strength is the back end of our operations regarding costs, materials, inventory etc. On the front end the financial tools are adequate but not strong. 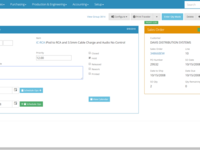 Overall: User friendly and improved control of materials. Pros: The system is web based and very easy to use. Compared to other providers, the cost is considerably lower. Customer Service is out standing. The FE team is always willing to help with customizations to meet our company needs. Cons: FE does not offer some features provided by the larger software companies. Overall: FE makes my job easy. Pros: It is very easy and simple to use. It is very easy to learn and train new employees on Factory Edge. I have been using this software for over 10 years and love it. Cons: Not many people know and recognize this software. I don't really have anything that I don't like about Factory Edge. Overall: It made my job very simple. Cons: The lock down of the accounting side of things are a bit ambiguous. 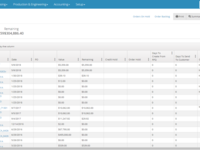 Sales orders and Invoices and easily be changed causing accounting issues in the past. It has been great. The team is very responsive and knowledgeable regarding manufacturing and tech. 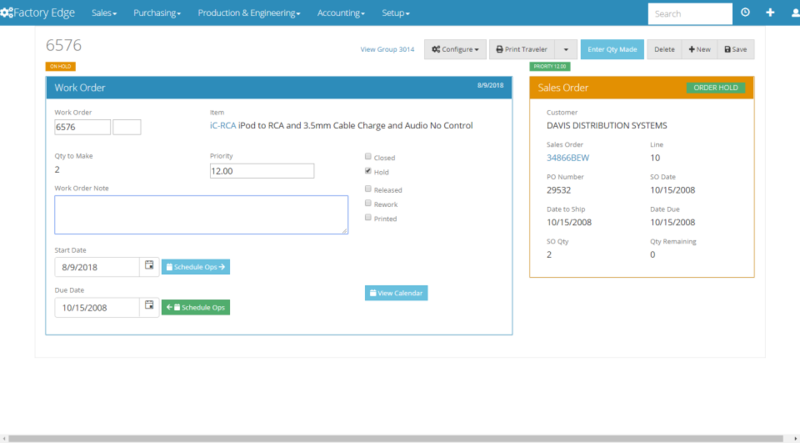 Pros: The ability to help streamline our workflow and to help us increase the bandwidth of our manufacturing process. The ease of use allows our employees to quickly get up to speed and use the system without unnecessary delays. Cons: We only have minor issues that are mostly due to our sometimes spotty internet connectivity. Since the data is housed in the cloud, we are sometimes unable to connect. This rarely is an issue though. Best MRP system I've ever used. Pros: Easy to use, Can access from anywhere so I'm able to work from home. Simple to export files to Excel. Cons: I can access the system from anywhere, so the boss expects me to work from anywhere and at anytime. Pros: Accuracy with our inventory. Ability to notify you of a duplication of a work order. Cons: Wish it would be able to log who makes an input inquiry. Overall: Software works great for out industry. Pros: Very user friendly and easy to navigate. Overall: Great overall. Easy to learn and navigate. Pros: Very easy to use and train new employees on.